As I’ve mentioned in several previous postings, our national anthem isn’t just a song for the start of a hockey game or a morning ritual in an elementary school classroom. It’s the symbolic glue that unites us from coast to coast with a common story and belief about our shared life together. It unites strangers in a way nothing else can. And there are forces at work today that want to change that story, and turn it into something it was never intended to be. And the cost to all of us is ….what? “Canada” is not a reference to level of government or a pin or a map or a flag or cultural group – and O Canada isn’t just some theme song played before an NHL game north of the 49th parallel. Whether in a small City Council meeting in Ontario, or gathered by the tens of thousands in a stadium near you, Canada is about a PEOPLE – you and I are Canada and O Canada is our song about ourselves. I have written in a previous posting (see link above) that recognizing Canada at the municipal level isn’t “inappropriate” as some buffoons have suggested. In fact, nothing could be more inappropriate than dismissing the national anthem of a country within that country’s borders, and particularly within any building of any level of government in that country. Do my eyes deceive me on Google Street View, or is there a Canadian flag flying in front of the Richmond Hill Municipal Building? If so, is that any more or less appropriate? A member of the Richmond Hill Council, in rejecting O Canada at the beginning of their Council meetings last year, actually suggested, according to The Rebel, that the anthem took too long to sing. Perhaps the Councillor in question might want to move to Uganda – their anthem is the shortest in the world – it’s only 9 measures in length, and the composer finished it in one day. Even better, right? And the most ridiculous reason that they nixed O Canada? According to the mayor, they got an absurd opinion from the town lawyer that singing O Canada would actually be illegal. That’s right – illegal. Apparently the phrase “God keep our land glorious and free” might be a problem, which was introduced to the anthem in 1980. 35 years ago. NOW it’s a problem? How idiotic. And the anthem itself is 109 years old, being introduced to the world in 1906. Their moronic conclusion was based on some misguided interpretation of a recent Supreme Court of Canada ruling, where prayer is no longer allowed at the start of their Council meetings. Oh yes, they snuck that one by most of us. The fear of the national anthem of Canada not being sung in Canada because of the word “God” in it is insanity. 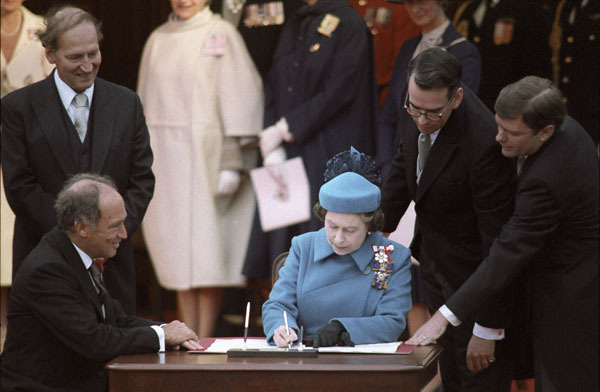 It could not be unconstitutional – the Constitution of Canada was signed in 1982. If the Constitution comes up against the anthem, the Constitution should go. It’s a useless document that has cost us millions in legal fees across the country anyway, and for what? The preamble to the Charter of Rights and Freedoms in Canada says: “Whereas Canada is founded upon principles that recognize the supremacy of God and the rule of law…” And now, some would like to see that removed as well. Can you imagine – the Charter of Rights could actually be unconstitutional? What a legacy of nonsense former Prime Minister Trudeau lavished upon us with this stupid Constitution and Charter. And now his idiot son continues the nonsense. Are we better off today than we were in 1982? We’ve opened the door to secular humanism, socialism, feminism, homosexuality and a host of other minority special interest groups that have weakened the societal fabric of our country and dictated future policy for the majority. And we are not “better” for it – we are immeasurably weakened by it. Once we stop recognizing the importance of our national identity, including our anthem, we stop having a soul. Canada is truly one of the blessed nations on earth and we don’t always show it outwardly. Stand with thousands of people at a sporting event today and you will actually HEAR thousands of people singing our anthem. And undoubtedly, if you stop and pay attention, you will get a lump in your throat. The numbers attending Remembrance Day services is also some of the highest since World War II. Why? Because there’s a new spirit of patriotism in Canada. It’s not hot and flashy and full of bravado and fireworks. It’s quiet, confident and a total adoration for the Canada we all live in – and that many of us would all die for. After the horrifying terrorist attack in Ottawa, our beloved capital city, the whole country went into mourning – we couldn’t believe such a thing could happen in our peaceful little country. 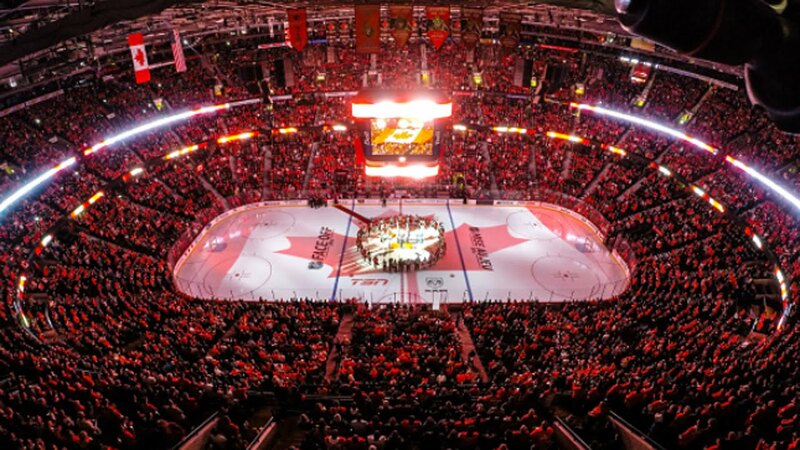 That Friday night, October 24, 2014, in an unprecedented show of solidarity, the NHL and Hockey Night in Canada joined three stadiums via satellite link – the Bell Centre in Montreal, the Air Canada Centre in Toronto, and the Canadian Tire Centre in Ottawa – and the combined crowd of nearly 60,000 fans sang O Canada in unison with all of their hearts. It was one of those moments in Canadian history we’ll never forget, and it was centered around our anthem – it said “we love you Canada” when we just were too speechless to say anything else. A staggering 300,000 new immigrants a year come to Canada, growing our population by nearly 1% annually. Why is there still such a heavy demand on our Immigration Canada offices and embassies? Because the rest of the world gets it – Canada is a glorious ideal, a melting pot of languages and cultures and nations and tongues and tribes together under one giant, peaceful, steadfast roof called the Dominion of Canada, stretching from Sea to Sea to shining Sea. The second largest land mass on earth houses one of the friendliest, most loving, most loyal, most giving nations on earth. The whole world sees us as a refuge from international storms, an oasis in the deserts of dictatorship and despair around the world. 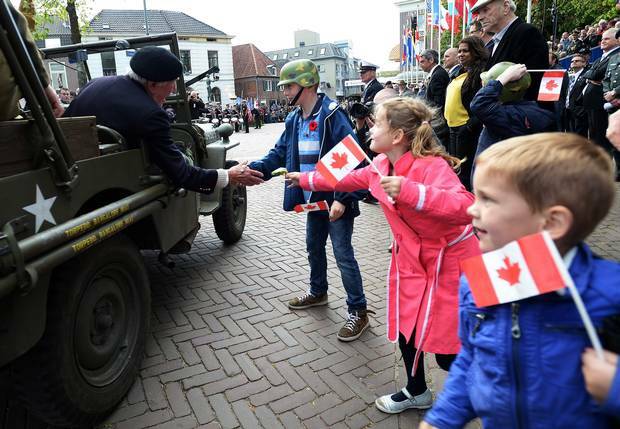 May 5, 1945 marks 70 years since the Canadian army defeated the Germans and liberated the Netherlands (known as Holland to some) from Nazi oppression. 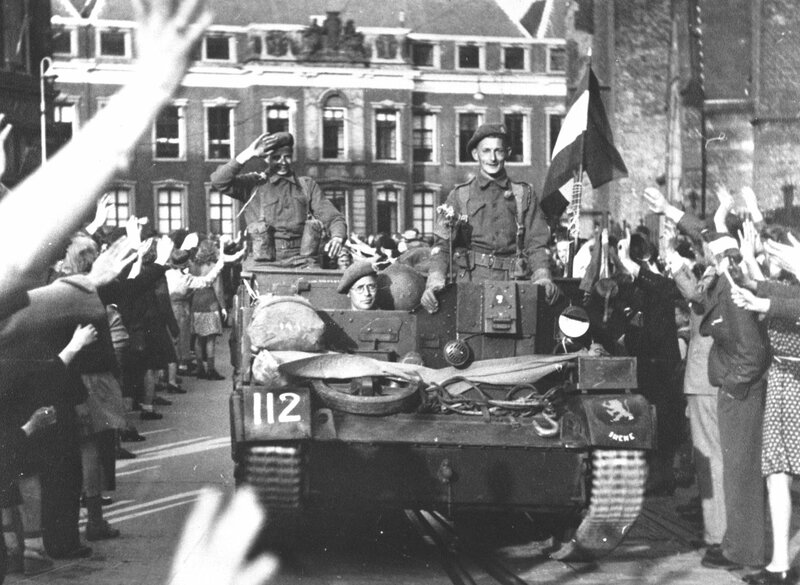 Not many are alive today that remember that triumphant victory, but the Dutch still celebrate Liberation Day every May 5 with massive crowds of 100,000 people or more. And they still sing O Canada at every event, every year, as they did just a few weeks ago. That’s why I personally will never stop singing O Canada in this country – I still think it’s one of the most beautiful anthems in the world – and to millions around the world, it represents liberty and freedom and peace and democracy and generosity. The American image worldwide has changed over the years to the negative. But not the Canadian image – our flag and our anthem still carry weight in countries throughout the world. And I dare anyone to try to tell me now that I can’t sing about this country I love at any specific location in Canada. No really, I welcome them to come to my house tonight and tell me that O Canada cannot be sung at any place within Canada. I dare them. With the Liberals now in the majority, Belanger should have little trouble finally ensuring that women feel equally included in the national anthem. Passage of the bill would be a fitting legacy for Belanger, who was diagnosed just a month after the Oct. 19 federal election with amyotrophic lateral sclerosis, commonly known as Lou Gehrig’s Disease. This was his second attempt – voted down in the Conservative government previously. The bill to change the lyrics passed in the House of Commons by a vote of 225 to 74 in June and is currently before the Senate. How many other nations change their national anthems to appease special interest groups? Great Britain will of course have to become gender sensitive with their anthem – they will have to change God Save the Queen to God Save the King, but that’s hardly the same thing, and for obvious reasons that are hardly equitable. A nation constantly changing the words to its anthem certainly gives the impression that it is insecure, indecisive, unsure of its roots, or where it wants to go in the future. Sounds like Liberals have had a go at it. The left wing, pinko, socialist jackasses that try to weaken this country will have to pry that beautiful Canadian flag out of my cold, dead hands. I love her, I will defend her at all costs against all enemies from without and within, and I would be willing to die for her if necessary. If you no longer feel the same, or you are here to discredit her, weaken her, harm her, or make her lesser than the great nation she already is today, get the hell out. I heard Cuba is nice this time of year – and there are plenty of left wing backwaters where you can strut your stuff and show off your brilliance, and enforce your anti-capitalist, anti-Christian, anti-family, anti-marriage, anti-God bulls–t. Besides, there are a lot of people rushing to get into this giant Harbour of rest and peace called Canada – and we’re gonna need your apartment.